We lingered over breakfast at the Holiday Inn Express this morning. I see that HIX is remodeling their breakfasts and partnering with Cinnabon, replacing their signature cinnamon rolls. (Not that I could have much of either, with my diabetes and all.) We left the hotel at 9:45 AM, made a brief shopping stop at Walgreen's, then dropped in for a very brief visit with my sister at the nursing home. Kelli was looking pretty good, and we were happy to see that one of her friends were coming to see her as Lisa and I left. After one last stop to buy a USB thumb drive at Fry's, we left Sacramento for the Bay Area, with but one more stop (gas at the truck stop at Lodi Junction). For a change, our travel plans went exactly to form, with us threading the needle between the end of Sacramento's commute and the beginning of the Bay Area high traffic. We got to the hotel just before 2 PM, and the Hilton let us check in right away. We even got what I consider the second-best parking space in the entire hotel, due to its proximity to the convention center doors. 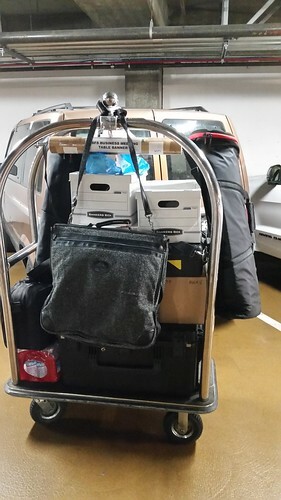 The bellman let us check out a cart (I tipped him $5 when I returned it; we'd rather move our own stuff than have someone move it for us) and started to unload the minivan. This was the first trip. Things packed pretty well. Lisa is getting good at it with years of practice in our road trips. Mind you, this load didn't include any of our personal luggage and clothing except for my business suit and WSFS uniform in the suit carrier. We went back for a second load, which included our personal luggage and the rest of the camera gear. Kuma Bear guarded Lisa's big Panasonic camera while we unloaded the cart and I returned the cart to the bell desk and retrieved my driver's license left as security against it. 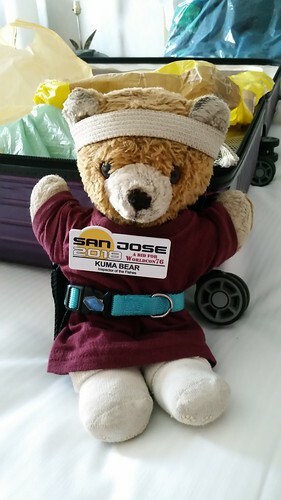 When I got back to the room, I found that Kuma Bear was all kitted up and ready to go. Lisa was doing a good job unloading things and filing up the room. While this is not a mini-suite, it's a generally well-laid out and spacious standard hotel room, unlike some of the telephone booths we've stayed in over the years. One criticism, though: the hotel room safe sits on a pedestal smack in the middle of the closet, seriously compromising the closet's floor storage space. It did take me quite a while to get my things set up. Besides having to unload my luggage and put stuff away, I had to get the computers going. I spent quite a while trying to get the computer we plan to use to upload WSFS Business Meeting video going, and I couldn't figure out why it wouldn't find the wi-fi until I finally realized that I had the hardware switch turned off. We don't have wi-fi at home and therefore I leave the wireless disabled. Silly me. While Lisa washed her hair, I went down to the convention center, where set-up was moving right along. Dave McCarty, the lead Hugo Award Administrator, and I went to the Hugo Office, where we worked on the finalist certificates. 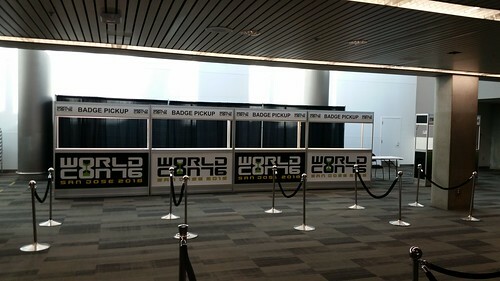 While not required, many Worldcons give finalists certificates recognizing them making the final ballot. One of the specific things we were putting on this year's certificates are gold-foil labels embossed with the corporate seal of SFSFC, Worldcon 76's non-profit parent organization. SFSFC bought an embosser and 1000 seals back in 1993 after ConFrancisco, and we used the seals on the 2002 certificates as well. I'm the corporate secretary of SFSFC, but I've never felt comfortable removing the corporation's seal from the state where the corporation lives, so I've left it with the deputy Secretary, who got it to Dave today. I embossed a couple hundred seals (there are quite a few finalists when you total it up), and Dave and I applied them to the certificates. That's a good job done. I noted that the Hugo Office for this Worldcon is a lot more comfortable than the one we had in 2002, when the ceremony (and the office) were in the un-air-conditioned Civic Auditorium across the street. Poor Lisa had to spend an afternoon up on the top floor assembling (and in one case having to re-tap with the tap-and-die set she had in her truck because that's the kind of person she is) Hugo trophies in the heat until someone came to relieve her and lock up the office. With the certificate assembly done, I took the corporate seal with me and went downstairs to the Registration area, which will open tomorrow afternoon. I met up with a lot of the WC76 team and other fans coming in early. I collected my MIMO (move in/move out) wristbands for Lisa and me so we can access set-up tomorrow. I met up with Linda Deneroff (coming off her Seattle-to-San Jose road trip with Joni Dashoff) and Linda, Lisa Deutsch Harrigan, my wife Lisa, and I went to Ozo Sushi for dinner. It was nice to not have to rush. I don't expect a lot of unhurried meals for the next ten days. LDH had a movie to see at 3Below, but Linda stayed with my Lisa and the three of us went over to Flames to make a reservation for a breakfast meeting I'm hosting for the WSFS Division leadership on Thursday, and then we went by Safeway for some groceries. There's a pretty good-sized mini-fridge in our hotel room, so I got yogurt and milk and Lisa got some grape juice. Unfortunately, as my tote bag was full of SFSFC corporate seal, I had to buy a bag at the grocery store, and even more annoyingly, I discovered when we got back that while I was charged for all four yogurts, only three of them got into the bag. I decided it wasn't worth the walk back to Safeway and wrote it off. Oh well. Things are coming together here in San Jose. I'm really glad to be here.